Maersk Line, a Danish shipper, announced in February 2011 that it had ordered ten new colossal container ships. 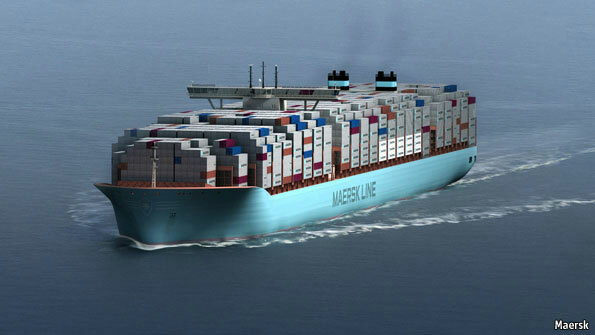 The new ships known as “Triple-E” ships will carry 18,000 boxes each, that is 2,500 more than the biggest container ship currently in service also operated by Maersk. The new vessels will come into service in 2013. The new ships will sail the trade routes between Asia and Europe, arriving in Europe packed with Chinese-made TVs and fridges but sailing back much lighter. Container shipping rates are rising and global trade is predicted to grow by 6-8% this year. Some believe global trade in shipping could grow even further— Clarksons—the world’s biggest shipbroker, is predicting growth of around 10%. From the 1990s and into the first decade of the 21st century the volume of container cargo traded through the world’s biggest container ports has increased nearly sixfold as globalisation has taken hold. The first container ship voyage took place on 26 April 1956, the ship was an oil tanker whose deck had been strengthened to accommodate 58 well-filled boxes each some 30ft (9 metres) long. The boxes were shipped down the east coast of the US into the Gulf of Mexico and on to Houston. They survived the journey. They were not swept unrecoverably into the sea, as some doubters had predicted. Trade was ready for a new mode of transport. The savings made by moving freight from roads to sea were huge. For centuries the trade of the world had depended on there being a vast labour force at every port to handle goods in manageable quantities. Container shipping required less dock labour and as a result savings of as much as 25% could be passed on to the shippers. As containerisation spread around the world, ships were turned round more quickly with even more savings. By the 40th anniversary of container shipping in 1996, around 90% of world trade was moving in containers on specially designed ships. At that time Bill Clinton correctly proclaimed that container ships were aiding to “fuel the world’s economy”. Since then Container ships have continued to grow and grow. Some fast ships have been developed, but these are mostly passenger ferries. The big container ships that carry most of the world's long-haul manufactured exports (by weight) travel at 23 knots (26.5 miles an hour) at best, and barely 17 knots in heavy weather. The jet age that sank passenger liners has so far failed to take hold on the ocean. The Boeing 707 jet transformed aviation because it could fly faster, farther and higher than propeller-driven aircraft, clear of storms and turbulence. Ever since the Vikings built their longboats it has been accepted that the way to move quickly across water is to have long, thin boats. This is because the faster a ship travels, the more water it drags along with it. Not only does this drag consume much energy, it causes high-speed vessels to squat low in the water, pulled down behind the “captive wave” at the bow. Propellers vibrate at high speeds, causing shocks that can break hulls. Hydrofoils that lift the hull out of the water and use water jets are fine for passenger ferries, but not for big, heavy container ships. In the 21st century, container cargo of cars, tractors, cookers and washing machines still travel at about the speed of a running man. It takes a ship full of car parts a week or more to cross the Atlantic and around three weeks to go from Asia to Europe. The next challenge will be to design a faster colossal vessel capable of carrying 18,000 containers but at a much greater speed. Surely with such high inter-continental trade forecasts between Asia and the US and Europe, the incentives to develop a new high-speed container ship have never been better. En la actualidad, estos súper cargueros (Post-Panamax) no pueden circular por el canal de Panamá y deben rodear el cono sur americano por el Cabo de Hornos, con el consiguiente sobrecoste de transporte. En la actualidad se está llevando a cabo la ampliación del citado Canal, con la construcción de una tercera exclusa, cuya finalización está prevista para 2014. El desarrollo de buques más veloces podría suponer un cambio en las rutas marítimas internacionales, hoy drásticamente vinculadas a los Estrechos (Suez y Panamá principalmente). This is really an interesting article. I just so much like this one. This is really new to me but I would share this stuff with my father for sure after come back from my yosemite tour from San jose for sure.